Once again elevating the industry standard, Marvel introduces the new generation of Chateau Collection champagne and wine cellars and beverage centers. Inside these magnificent models, you will find beautifully understated and discreetly located digital touch controls with elegant blue LED displays. The intuitive control panel is governed by Marvel’s exclusive Sentry System™ refrigeration monitor, which provides visual and audible alarms for over/under temperature, power failure, and door ajar conditions. Each model features Marvel’s signature black interior, enhanced by full-extension glide-out racks. Wine racks are specially designed to hold all shapes of wine bottles and include removable vibration dampening mats to protect against unsettling wine vibration. Other thoughtful features include soft display lighting, built-in user-activated Sabbath mode, solid white maple rack facings and a clean, adjustable 4" toe kick. 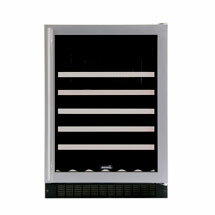 The Dual Zone Wine Cellar offers the control, consistency and convenience needed to serve wine immediately at optimum temperatures and from two distinct zones. Each of the two zones is monitored by Marvel’s exclusive Sentry System™ refrigeration monitor, allowing each to be set and maintained at precise temperatures. As a result, reds or whites are ready to serve at precise temperatures from either compartment. 33-3/4”H x 23-7/8”W x 23-5/8”D, 170lbs, 5.45 cu. ft.
Lovers of stainless steel will admire the exquisite Chateau Collection 6SWCE-BS-GX. In addition to its capacious ebony interior, it offers glide-out racks with gleaming stainless steel facings – the perfect complement for a pro-style kitchen or contemporary décor. Even its UV-resistant glass door is framed in sumptuous stainless steel. 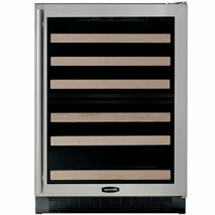 Six glide-out racks, one stationary wine cradle, 6.1 cu.ft. For substantial wine collections - and substantial entertaining - the Chateau Collection 8SWCE offers increased wine storage capacity, more than any other undercounter wine cellar on the market. Holding a generous 68 bottles, its broad 30-inch width, exclusive to Marvel, makes an expansive design statement. 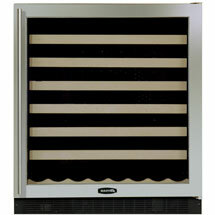 Six glide-out racks, one stationary wine cradle, 8.0 cu.ft. 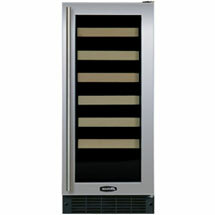 You may also order your wine cellar with a door that accepts a custom overlay frame supplied by your cabinet maker. The Marvel overlay frame is one of the simplest to install. Here is undercounter excellence at its finest. Designed to fit into – and yet maximize – 15-inch openings, the 3SWCE provides vibration-free storage for your finest vintages. Six glide-out racks, 3.0 cu. ft. This beautiful cellar is specially designed to hold champagne and other large circumference bottles. 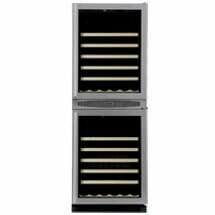 The glide-out racks, fronted in gleaming stainless steel, are wider and deeper to gently cradle champagne bottles. Recessed lighting elegantly showcases your collection. 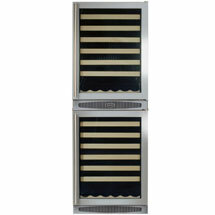 Six glide-out champagne racks with stainless shelf fronts, 3.0 cu. ft.
For the true wine connoisseur, Marvel presents the Chateau Collection 66SWCE, a towering achievement in wine storage. 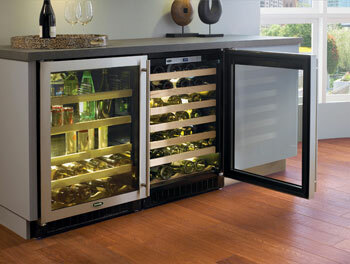 This full height wine cellar is a perfect combination of capacity and elegance. The two compartments have independent cooling systems, allowing you to set each to its own distinct temperature. 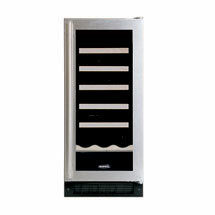 This deluxe model has a stainless steel clad exterior, stainless framed glass door, and stainless trim on the wine racks - all to showcase your wine beautifully. 34”H x 23-7/8”W x 24-1/4”D, 130lbs, 6.1 cu. ft. 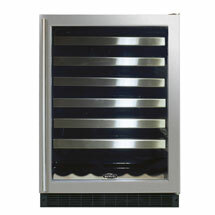 This feature-packed model fits into narrow 15-inch openings and cradles up to 23 bottles of wine in perfect storage conditions. 34-1/4”H x 14-7/8”W x 23-5/8”D, 100lbs, 3.0 cu. ft. This stellar performer, with its glossy black interior, is the stylish solution to serious wine connoisseurs’ storage and display needs. The upper and lower compartments have independent cooling systems, allowing you to set each to its own desired temperature.